• Drip irrigation, by which water is applied slowly through small emitter openings from plastic tubing. Drip tubing and emitters may be laid on the soil surface, buried, or suspended from trellises. • Microspray irrigation, also known as microsprinkling, by which water is sprayed over the soil surface. Microspray systems are used for widely spaced plants such as fruit trees. A third type of localized irrigation, bubbler systems, uses small pipes and tubing to deliver a small stream of water to flood small basins adjacent to individual trees. Bubbler systems may be pressurized with flow emitters or may operate under gravity pressure without emitters. They are not common and will not be discussed here. Descriptions and design procedures for gravity bubbler systems are given by Rawlins  and Reynolds etal. .
Drip irrigation systems are designed to slowly apply water to individual points. 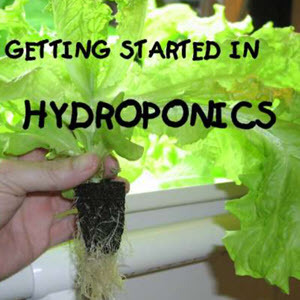 The spacing of the emitters, and thus the layout and cost of the system, depends on the crop spacing and rooting pattern and the soil characteristics. For closely spaced, watersensitive crops with small root systems, the emitters may be as close as 20 cm apart along each crop row. For row crops with extensive root systems in fine-textured soil, the emitter spacing may be up to 1 m on alternate crop rows. Two emitters per vine is common in vineyards. For tree crops, four to eight emitters per tree may be sufficient. Thus, emitter and tubing requirements for drip systems vary from 2500 emitters and 3000 m of tubing per hectare for widely spaced trees to 20,000 emitters and 15,000 m of tubing per hectare for closely spaced vegetable crops. Drip tubes are normally laid out in, or parallel to, crop rows. The tubing often is laid on the soil surface. In crops with trellising, such as vineyards, the tubing may be suspended from the trellising to keep it out of the way of tillage operations. In horticultural crops, thin-wall tubing (drip tape) may be placed a few centimeters below the soil surface and/or under plastic mulch to help hold it in place. Drip tubing also can be placed up to 60 cm below the soil surface. Subsurface drip irrigation (SDI), when placed below tillage depths, allows the tubing to be left in place for several seasons. 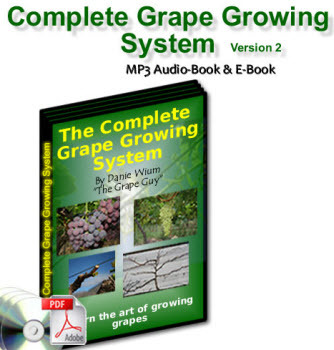 It also minimizes wetting of the soil surface and thus weed germination and surface evaporation. Subsurface drip usually requires specialized tillage operations and equipment, and also requires special equipment or management to prevent roots from growing into and plugging the emitters. It may require sprinkling to germinate new crops or to periodically leach salts. Specialized equipment with a hollow shank is used to inject drip tubing to the desired depth. A disadvantage of subsurface drip is that plugged emitters are not evident until the crop is damaged. Special care must be taken to prevent plugging. Drip tubing is made from polyethylene. Tubing wall thickness varies from 0.1 mm to 1.3 mm. Thin-walled (0.1-0.4 mm) tubing, sometimes called drip tape, lays flat when not pressurized and usually is used for only one season. Thick-walled tubing can be used for several years and may be removed and replaced between crops. Drip-tubing diameters (outside) vary from 6 to 35 mm, but 16, 18, and 21 mm are the most common sizes. With moderate emitter discharge rates (4 L h-1 or 6 L h-1 m-1), 18-mm thick-wall tubing or 16 mm thin-wall tubing can be used for run lengths up to 100 m without excessive pressure loss (<30 kPa). With thick-wall tubing, it is often less expensive to subdivide a long field with submains rather than use large-diameter tubing. Large-diameter thin-wall tubing recently has become available that allows long (400 m) run lengths. Figure 5.30. Drip tubing in-line emitter (upper) and on-line button pressure-compensating emitter (lower). agriculture because of plugging and poor water distribution. Tubing with small holes punched or laser-drilled through the walls is not recommended for the same reasons. Tubing with in-line emitters can be installed quickly and easily. Figure 5.31. Wetted bulbs for (a) fine-textured soil and (b) coarse-textured soil. perennial crops mature, and plugged emitters can be replaced. On-line emitters usually are not buried and generally are used only for perennial crops. Drippers are point sources of water with small discharges, typically 1-8 L h-1 with 2 and 4 L h-1 being most common for thick-wall tubing and 1-2 L h-1 being common for closely spaced emitters in thin-wall tubing. 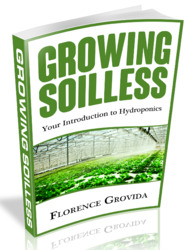 The water enters the soil profile and percolates downward and outward. The result is a bulbous-shaped volume of moist soil. The size and shape of the "bulb" depend on the discharge rate of the emitter, the duration of application, and the soil type. Other conditions being constant, the bulb is more circular in fine-textured soils, in which the major water-moving force is capillary, whereas, in coarse-textured soils, the movement of water is caused largely by gravity and a narrower, deeper bulb results (Fig. 5.31). 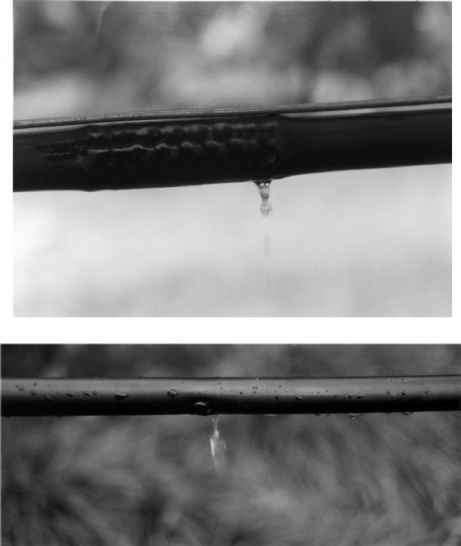 High discharge rate may increase the relative horizontal wetting. On the ground surface, wetted circles form, which may coalesce into continuous wetted strips. The soil surface between the tubing is kept dry. Active plant roots are concentrated inside the wetted bulbs and therefore may be restricted in volume. Nevertheless, yields often (but not always) exceed those obtained by other irrigation methods. This is because, inside the bulb, light, frequent irrigations and fertilizer applications (fertigation) can maintain optimum growth conditions. Irrigation frequency varies from daily to every three or four days. Salts in the soil move with the water toward the periphery of the wetted zone. Inside the wetted bulb, where the main root activity occurs, the salt concentration is generally low and not harmful to plants. However, lack of periodic leaching from irrigation or rainfall can result in harmful soil salt concentrations near the edges. These salt concentrations can be especially damaging during germination of new crops, or if rainfall moves the accumulated salts back into the active rooting area. Periodic large water applications are required to leach out salts. This must be done often with sprinklers. Figure 5.32. Microspray irrigation showing a half-circle pattern sprayer and the microtubing connection. Figure 5.33. 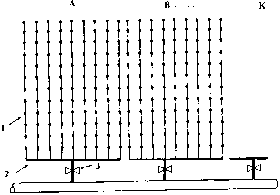 Typical microspray wetting patterns. the spray pattern. A variety of flow rates and patterns are available. 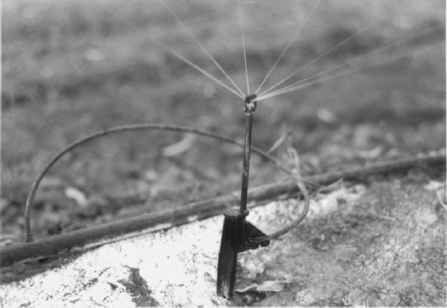 Microsprayers usually are inserted into the end of short pieces of 6 mm tubing and held upright on a stake (Fig. 5.32) or hung from suspended tubing. The small tubing is attached to the drip-tubing laterals with small plastic barbed connectors. In addition to sprayers, various types of spinner heads also are made, on which the jet impacts a small groove or channel that rotates, rapidly throwing the water in a circular pattern. Spinners usually produce a larger wetted pattern. Microsprays are commonly used for widely spaced tree crops. They also may be used in greenhouses. In tree crops, one or two sprayers are used on each tree. The pattern usually is oriented so that the water does not spray on or at the base of the trunk, to reduce disease problems (Fig. 5.33). Flow rates from microsprayers are generally much higher than with drippers—typically 20 to 80 L h-1. Although the spacing between sprayers may be 2 to 4 m, flow rate per unit length is usually higher than with drip systems, and so, larger tubing or shorter runs are required. Figure 5.34. Layout of a microirrigation system with automatic valves to control irrigation for several sets: 1) lateral with emitters, 2) manifold, 3) automation valve. Water is supplied to one end of the drip or microspray tubing through a manifold. These are usually buried PVC or polyethylene pipes, but in temporary systems, also may be flexible tubing laid on the surface. Flexible tubing or hose often is used to connect the surface drip tubing to buried manifold pipes. In large systems, main and submain pipeline networks deliver water to the manifolds. Manual or automatic valves are used to distribute water to the desired sets (Fig. 5.34). Pressure regulation may be required in the distribution system, as well as air release valves for SDI systems. The downstream ends of all drip or microspray lines must be accessible for flushing. Individual lines can be flushed manually by opening the downstream ends, or by pressure-activated flush valves. With SDI, sets of lines usually are connected to a flushing manifold so they can be flushed simultaneously. Microirrigation systems require a pump to pressurize the water, one or more filters to clean the water, and valves to regulate pressure. Microirrigation water is applied under low pressure, usually in the range of 50 to 200 kPa. Thin-walled drip tubing usually allows no more than 80 kPa. For other systems, pressures are usually at least 100 kPa to reduce the effects of varying pressure on uniformity. Because emitter orifices or paths are small, filtration is nearly always required. Several types of filters are available for different types of contaminants. Fertilizer injection is recommended to gain the full benefit of precise management. Chemical injection to clean emitters is required with some water qualities and is recommended with SDI. Automation, through use of automatic valves and controllers, reduces labor requirements.